Need a pet-sitting service? We will temporarily care for your small animals at our around-the-clock fully air-conditioned, non-smoking accommodation. 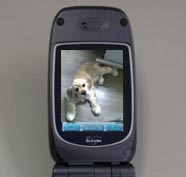 We will keep a keen eye on your pet at all times, and your pet will enjoy the low-stress environment that we provide. Reservations are required. In addition to small animals such as rabbits and mice, we also accept small dogs and cats. We quickly become fully booked for the holiday seasons, The year-end and New Year's holidays, Golden Week, and O-bon, In the holiday seasons. Only members who have used the hotel in the past can book in the holiday seasons. Please don't cancel in the season. You need pay cancellation fee when canceling in the season..And please make reservations ahead of time for these occasions. We are quick to grasp each animal's individual character and we care for each of our animal guests in a manner designed to prevent loneliness or fear of an unaccustomed environment. Your animal companion will greet you with cheerful friskiness after a stay with our kind-hearted staff! Adult or baby animals are accepted. Our staff members are familiar with pets of all types and ages; they are also knowledgeable with regard to medical care. Your pet(s) will benefit from our staff's full affection and care. *Negotiable for other small animals such as fish, birds, reptiles, and insects. *We can take your puppy out for a walk for free! Please request this service. 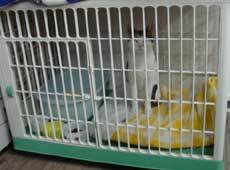 Cage Fee *An additional cage fee (\300-\500 per cage) will be charged if a customer uses our cage. However, no cage fee is charged if a customer brings his or her own cage. 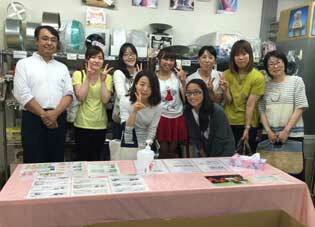 Discount Rates ・10% off the basic sitting charge for service of one week or longer. ・20% off the basic sitting charge for service of one month or longer. 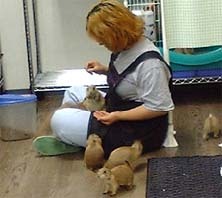 ・Discount rates may be applied depending on the number of animals in another cage. 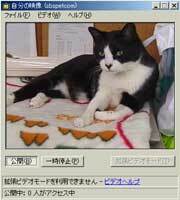 ・Irrespective of species, special discount rates may be applied for 10 animals or more. Estimates available. Komaki, Inuyama, Konan, Iwakura, in Aichi Prefecture. For business reasons, some cases are not eligible for our services. Please reserve Pet-hotel after you decide schedule. Please do not cancel. >The following might not be acceptable candidates for our services: pets in poor health, pets with fleas or mites, and pets suffering from infectious diseases or skin diseases. Dogs and ferrets must have had all annual vaccinations. Please inform us of any concerns in advance. We take no responsibility if your animal companion becomes ill from a known condition that we were not warned of in advance. We ask that you complete annual vaccinations for cats, too. Please rest assured that our accommodations and cages are kept clean, and that our equipment is sterilized after each use. >First-time customers will be required to submit a form of identification, which we will copy. 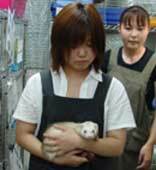 For ferrets and dogs, a certification of vaccination is also necessary. Dogs may be weighed on the day they check in. >Please tell us in advance if your pet requires special meals or snacks. If your animal eats only a certain food, which we do not sell here, please bring the food with you. Please also let us know any other care information specific to your pet. >Unless otherwise specified, our staff make a point of having animals play and exercise outside their cages, and having physical contact with them. Please let us know if you do not want your animal released from its cage. However, animals in poor health may remain caged. We take care to allocate individual play times outside the cage, so your pet will not be in contact with other animals. >Dogs and cats can be cared for in separate sections of the room, or in the Animals Caring Room at our headquarters, so that they will not cause stress to other small animals. If your pet desires company or does not like to be alone, our staff can hold and comfort your pet or release it in a partitioned room. >Security systems provided by a security company are set during nighttime hours to guard against fire or robbery. In addition, remote monitoring systems and midnight patrols by our staff are designed to help you feel confident about your pet's security. > Please do not hesitate to ask us any questions that you may have. This operation is, of course, a business. However, we know that watching over your animal companion--a companion you think of as an important family member--must be based on mutual trust. Once we have taken responsibility for your pet, we will provide wholehearted service. We will ask you to sign an acceptance form when you check in your animal. >Live-image wire service through the Internet is also available for customers who want to know how their animal is doing at our pet hotel. We can also send images or motion pictures to your cellular phone. Both services are free of charge. If you are interested in these services, please request them when you bring in your pet. 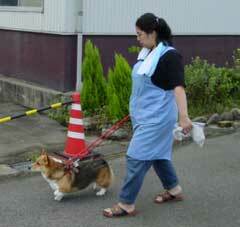 >Some animals, such as large dogs and tropical fish, are susceptible to stress from changes in their environment. Our staff can also be dispatched to watch over your pet in your home. Please visit our pet hotel during the afternoon, if possible, as in the morning our staff are busy caring for the animals. At your request, our staff can be here for you, even after 18:00. Take the Meitetsu Subway on the Meijo Line from Nagoya Station. At Heian-Dori Station, transfer to the Kami-Iida Line.